Coral snakes (poisonous) which look like a King-snake which is a great rat catcher. Nature colors the King-snake and friends similar as a protective warning to birds and other predators. There is also the Scarlet and the King Scarlet. 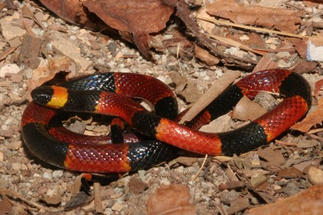 There are many varieties of coral snakes throughout the Americas, but we will address the southern USA snakes. The most common species in the United States have a universal red-yellow-black-yellow pattern. Not all coral snakes have the same color scheme, so it is important to be familiar with the snakes specific to your region. This snake is small in comparison to other venomous snakes in the United States. At its longest, an adult can measure around thirty inches. The colorful body is slender and lacks real variance in width. The head blends seamlessly into the body with no distinctive neck. The head of this species of coral snake is always black. The most obvious feature of an eastern coral snake is the bright body pattern of red, yellow, and black rings in which the red and yellow rings touch each other. The nose is black. Scarlet kingsnakes, (Lampropeltis triangulum elapsoides) and scarlet snakes (Cemophora coccinea) are superficially similar but the red only touches the black rings. The coral snake is the only eastern species of snake with a pair of fixed fangs in the front of the mouth. It is from the Mamba and Cobra family of friends, small but has a nasty venom. If red is bordered by yellow, he’s a bad fellow. The good guy is on the right. 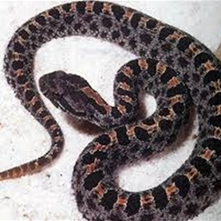 Crotalus adamanteus is a pit viper species found in the southeastern United States. It is the heaviest though not the longest venomous snake in the Americas and the largest rattlesnake. No subspecies are currently recognized. This is the largest rattlesnake species and is the heaviest known type of venomous snake, with one specimen shot in 1946 measuring 7.8 ft in length and weighing 34 lb. However, other venomous snakes may rival this species in weight, the much longer but more slender king cobra is probably greater in average body mass if not maximum weight and the shorter but even bulkier gaboon viper could (but is not verified to) exceed the rattlesnake in both mean adult body mass and possibly even maximum body mass. The color pattern consists of a brownish, brownish-yellow, brownish-gray or olive ground color, overlaid with a series of 24–35 dark brown to black diamonds with slightly lighter centers. Each of these diamond-shaped blotches is outlined with a row of cream or yellowish scales. Posteriorly, the diamond shapes become more like cross bands and are followed by 5–10 bands around the tail. The belly is a yellowish or cream-colored, with diffused, dark mottling along the sides. The head has a dark post-ocular stripe that extends from behind the eye backwards and downwards to the lip; the back of the stripe touches the angle of the mouth. Anteriorly and posteriorly, the post-ocular stripe is bordered by distinct white or yellow stripes. 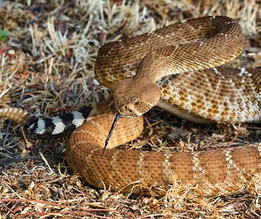 Common names include eastern diamondback rattlesnake, eastern diamondback, diamond rattlesnake, diamond-back rattlesnake, common rattlesnake, diamond-back, diamond(-patch) rattler, eastern diamond-back eastern diamond rattlesnake, Florida diamond-back (rattlesnake), Florida rattlesnake, lozenge-spotted rattlesnake, rattler, rattlesnake, southeastern diamond-backed rattlesnake and more. Northern ares of Florida bordering other states. Agkistrodon contortrix is a species of venomous snake endemic to Eastern North America, a member of the subfamily Crotalinae (pit vipers). The common name for this species is the copperhead. The behavior of Agkistrodon contortrix may lead to accidental encounters with humans. Five subspecies are currently recognized, including the dominent subspecies described here. Adults grow to an average length (including tail) of 20–37 in. Some may exceed 3.3 ft, although that is exceptional for this species. Males are usually larger than females. Good-sized adult males usually do not exceed 29 to 30 in, and females typically do not exceed 24 to 26 in. The body is relatively stout and the head is broad and distinct from the neck. Because the snout slopes down and back, it appears less blunt than that of the cottonmouth, A. piscivorus. Consequently, the top of the head extends further forward than the mouth. The color pattern consists of a pale tan to pinkish tan ground color that becomes darker towards the fore-line overlaid with a series of 10–18 (13.4) cross-bands. Like all pit vipers, A. contortrix is generally an ambush predator: it takes up a promising position and waits for suitable prey to arrive. One exception to ambush foraging occurs when copperheads feed on insects such as caterpillars and freshly molted cicadas. When hunting insects, copperheads actively pursue their prey. Juveniles use a brightly colored tail to attract frogs and perhaps lizards, a behavior termed caudal luring. In the Southern United States, they are nocturnal during the hot summer months, but are commonly active during the day during the spring and fall. Like most North American viperids, these snakes prefer to avoid humans and, given the opportunity, will leave the area without biting. However, unlike other viperids they will often “freeze" instead of slithering away, and as a result, many bites occur from people unknowingly stepping on or near them. This tendency to freeze most likely evolved because of the extreme effectiveness of their camouflage. When lying on dead leaves or red clay, they can be almost impossible to notice. They will frequently stay still even when approached closely, and will generally strike only if physical contact is made. Like most other New World vipers, copperheads exhibit defensive tail vibration behavior when closely approached. This species is capable of vibrating its tail in excess of 40 times per second— faster than almost any other non-rattlesnake snake species. Copperheads may release a cucumber-smelling musk if touched. The timber rattlesnake, canebrake rattlesnake or banded rattlesnake (Crotalus horridus),is a species of venomous pit viper endemic to the eastern United States. This is the only rattlesnake species in most of the populous northeastern United States and is second only to its cousins to the west, the prairie rattlesnake, as the most northerly distributed venomous snake in North America.No subspecies are currently recognized. Adults usually grow to total length of (36–60 in). It was found in Pennsylvania that the smallest size females that could produce viable eggs was 28.4 in. Most adult timber rattlesnakes found measure less than 39 to 45 in total length and weigh on average between 1.1 and 3.3 lb often being towards the lower end of that weight range. The maximum reported total length is 74.5 in. mentions a large specimen caught in Montgomery County, Alabama, which had a total length of 62.5 in and weighed 5.5 lb. Large specimens can reportedly weigh as much as 9.9 lb. This is a very small rattlesnake averaging 15 to 22 inches long. Their rattle is so small it sounds like an insect buzzing. They are gray with colored blotches running down the back. Its bite is painful but typically not fatal. This snake is responsible for more snake bites in Florida than any other venomous snake. Children should definitely be educated about this animal; because of its small size, a child (or event adult) may believe this to be a “harmless" snake. Also called the water moccasin, it is a venomous water snake. Their body coloration ranges from patterned to simply a dull black. You can identify this species by the black "eye line" that runs from the side of their eye back down the side of their head. Juvenile cottonmouths have a different coloration than adults do, but will still have this "eye line". 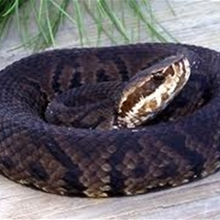 Water Moccasins all have poisonous bites that require immediate medical attention. If at all possible, and the snake has been dispatched, bring it with you to a trauma clinic, the responders will know where to go. Different poisonous snakes have unique venoms and require specific anti-venoms. Some of the venoms are neural-toxins, some breakdown blood, some cause internal bleeding, dying tissue. Time is valuable and knowing the snake is critical. There is no one anti-venom saves all, thats a myth. 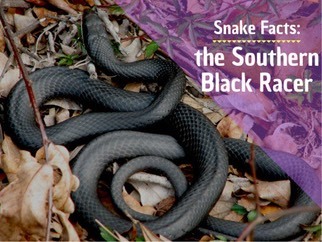 Because it is a Black snake and the fastest thing on one foot. They are a protected specie, harmless to humans and have an enormous appetite for mice and rats. Thats why they are protected. If you find them in your yard, think, you probably have rats close by. I’d rather have the snake. Last year one got into a friends garage, and armed with shovels and rakes they wanted to organize a hunt and dispatch about a four footer. I explained to my friend he’s here because you have a rat nest somewhere here. I gently picked him up, bare handed, no aggression, put him in a bag and dropped him at the park. I told them get an exterminator. The rats had nested in their attic. Well, not nested it was the neighborhood rat condo. Ever wonder why cats look at ceilings, they hear the rats scurrying along. The cost of fiberglas removal, patching rat holes, and tunnels, some roof work at openings, replacing the insulation with new media and re-sealing the attic was 4700 dollars on a 2600 sq. foot house. Recently our most predatory additions of epidemic size and now a state program to try and bring under control, Pythons and Anacondas, some bigger than twenty feet long have taken on the Gators as top of the food chain in the Everglades. Not poisonous, but able to crush anything they get around, especially humans who don’t stand a chance, and yes they do have huge teeth to hold on to you while they choke the daylight out of your brain. They have gotten even bigger in the perfect unrestricted topographical growth and abundant food sources of the Everglades. They were dumped in the Everglades by really thoughtful citizens when they got big enough to eat small deer and children, theirs. The South Florida Water Management District Governing Board is taking aggressive action to protect the Everglades and eliminate invasive pythons from its public lands. Starting in March 2017, the Python Elimination Program incentivizes a limited number of public-spirited individuals to humanely euthanize these destructive snakes, which have become an apex predator in the Everglades. The program provides access to python removal agents on designated SFWMD lands in Miami-Dade, Broward, Collier, Hendry and Palm Beach counties. Best bet is leave snakes to those who know what they are doing. Again and I repeat please just don't kill a snake because it crossed your path. Generally they retreat and quickly get out of your way. Smack the ground with the shovel, they pick it up the vibrations and they exit very quickly. REPEAT: There are some protected species in Florida. The Black Racer diet is based on the fact it actively eats mice. They and it is related to the more colorful CORN SNAKE and are considered good snakes. And if a snake is hanging out near your house, most likely you have rats and mice too. Think of the snake as your partner in rat and mouse control. THE CORN SNAKE (Pantherophis guttatus) is a North American species of rat snake that subdues its small prey by constriction. It is found throughout the southeastern and central United States. Their docile nature, reluctance to bite, moderate adult size, attractive pattern, and comparatively simple care make them commonly kept pet snakes. 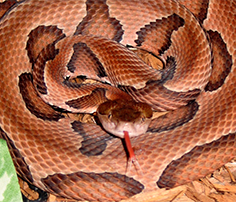 Though superficially resembling the venomous copperhead and often killed as a result of this mistaken identity, corn snakes are harmless and beneficial to humans.Corn snakes lack functional venom and help control populations of wild rodent pests that damage crops and spread disease. 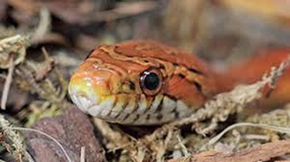 The corn snake is named for the species' regular presence near grain stores, where it preys on mice and rats that eat harvested corn.The Oxford English Dictionary cites this usage as far back as 1675. Some sources maintain that the corn snake is so-named because the distinctive, nearly-checkered pattern of the snake's belly scales resembles the kernels of variegated corn.Regardless of the name’s origin, the corn reference can be a useful mnemonic for identifying corn snakes. 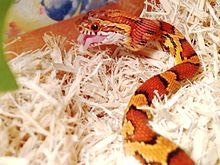 Corn snakes are one of the most popular types of snakes to keep in captivity or as pets. Their size, calm temperament and ease of care contribute to this popularity. Captive corn snakes tolerate being handled by their owners, even for extended periods. A corn snake's space requirements are low, since a 20 to 25-gallon vivarium provides enough room for a fully grown snake. Corn snakes enjoy hiding and burrowing, usually accommodated with a loose substrate (such as aspen wood shavings or newspaper) and one or more hide boxes. 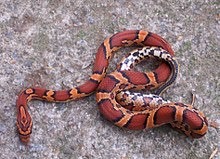 Captive corn snakes are generally fed pre-killed or stunned feeder mice, because captive-bred rodents reduce the risk of pathogens or live prey-induced injuries.